Did you know you can use a few things like lemon, salt and coconut oil for routine maintenance in your kitchen? Not only do these pure ingredients have infinite uses in skin care, they work like a charm in the kitchen, saving you money and exposure to harsh cleaning products. You can clean and condition wood cutting boards naturally using only lemon, salt and coconut oil. Sound like a spa treatment? It should! The next time you squeeze the juice of a lemon, save those lemon halves and give your wooden cutting boards or butcher block a deep cleanse. Half a lemon and some coarse salt are all you need. 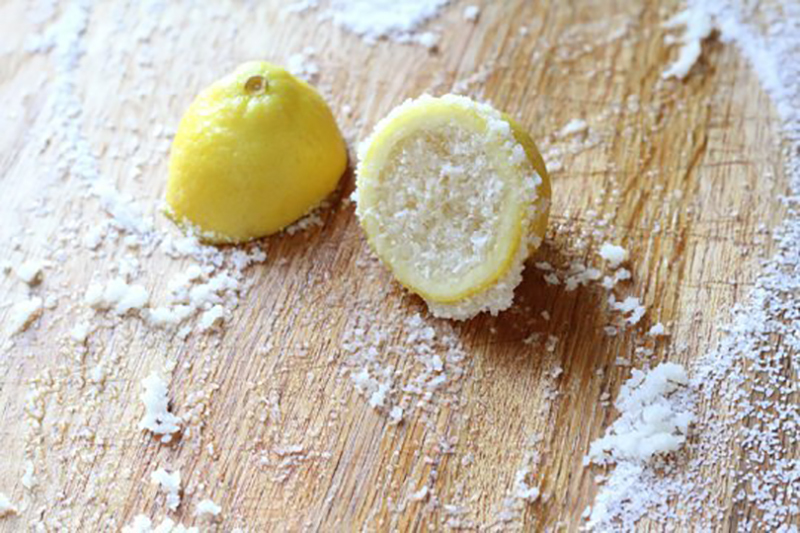 Just sprinkle the cutting board with salt and scour the surface with the lemon half (cut side down). Let it sit for 5 minutes and then scrape the dirty liquid into the trash. Rinse the board or wipe down with a wet sponge. Fresh, clean and disinfected without harsh products. I have a butcher board counter top that gets this scrub down now and it makes the whole kitchen smell like fresh lemon, so I actually enjoy this chore! There you have it—treat your boards to this once a month and you’ll be happy with the easy results. Great insight, keep it up!